June marked the release of the new Georgian wine book and meant a trip over to Georgia for a presentation at their annual wine fair in Tbilisi. It also meant that we’d be able to take a trip out to see kvevri production in action. 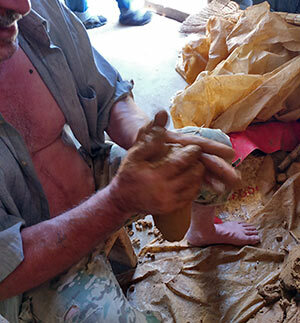 Previous trips hadn’t been so fortunate as given that a kvevri is made from clay, it needs warm but not hot weather to dry. At the same time, it can’t be too cold. Ironically, much like the wine they eventually will hold, they fall prey to the whim of the seasons and so, despite several trips to Georgia last year and visiting both of the main kvevri producers, we’d struck out in getting to see them in full action, although nice conversations about all things clay and wine were still enjoyed. So in June, the day after the presentation, we hopped into a car with co-author Daria Kholodilina (check out her Georgian wine tours) serving as both guide and translator for Zaliko Bodjadze, who is probably the most well-known of the producers and is conveniently located off the side of the main highway at a bend of the constantly-churning Dzirula River. As these things usually go, we’d called ahead to let him know we’d be coming. When we arrived, he seemed to have forgotten. This can happen in Georgia, but it’s usually not a problem as guests are guests and while it was clear we were interrupting his work, he took a great deal of time to show us around and explain his process. How to describe Zaliko? He’s not a tall man at maybe some 165cm in height but he has a center of gravity that could stand up to an atomic shock wave. Shake his hand and you’ll feel the grip of a man who has churned what must be thousands of tons of earth into intricate ceramics during his life. 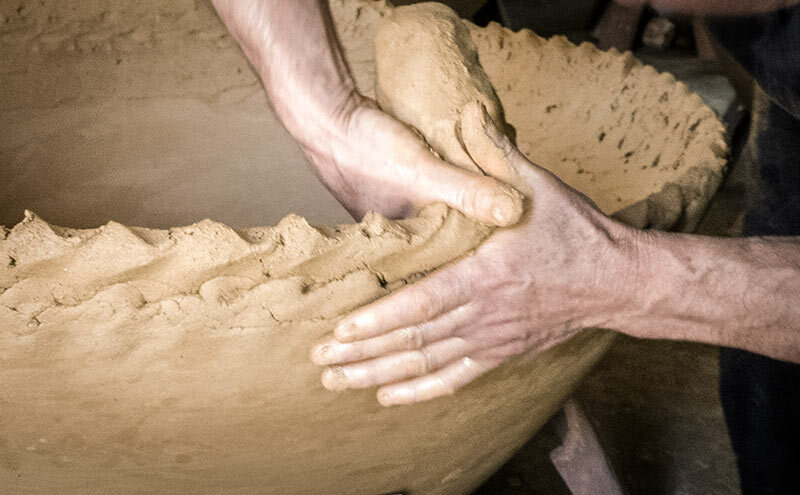 Having grown up in a ceramics-making household, I knew the profile well and it was the mark of the artisan that they could probably break every bone in your hand just when saying hello. To say that he’s a character is a bit redundant as a Georgian without personality simply isn’t a Georgian. And he went on about everything speaking in his distinct, Imeretian village accent. Bouncing about he showed us the process wherein he has his “coil master”, a fellow whose job is to simply pull out chunks of clay from a block of several tons in the corner that he twists into short little rods of 30cm in length and about 10cm wide. Then Zaliko takes these, scores up the top edge of the kvevri and works it into a new level of the kvevri, slowly building it up. This is the reason that the weather is so important as the walls of a kvevri are in actuality quite thin and so each added level needs to dry and cure before the next is worked in above it. It’s also why they’re usually producing something like 8-12 of them at a time, or basically as many as they can fit in their kiln. It’s a time consuming process that takes several weeks to finish a batch. We were then given a tour of the kiln which, when I’d last stopped by in November was bricked up, full, and cooling down, creating an unholy spot of heat in an otherwise nippy evening where we feared making it back over the pass due to snow. Now in June, they were just filling it up for the next firing, loading dried items of all types into it. 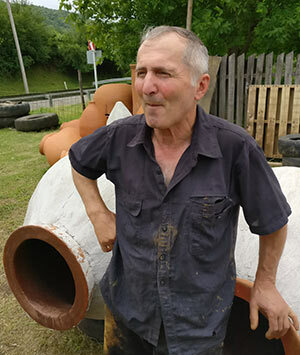 The kvevri might be the most romantic thing that Zaliko produces but he also makes bread ovens, smaller pots, and a number of other everyday clay “appliances”. Just before leaving we were of course presented with bread and some chacha. To not accept would have been rude although we stopped him from cutting up cucumbers and other veggies that had obviously been planned to be his and his team’s lunch. The chacha was surprisingly smooth and it’s amazing to me how I’ve taken to the spirit given how much I really don’t like grappa nor orujo which are the same thing albeit not originating from the seeds and stems of a kvevri–maybe that’s the special flavor. We thanked him for his time, posed for the obligatory photos next to the kvevri and then headed up the road to one of the many roadside places that dot the highways of Georgia. To quote my host from the first time I stayed in Georgia, “Here, it’s actually quite hard to eat badly” and it was true. A simple meal of Imeretian staples, we ate well although sadly, the only wines on the menu were from one of the larger “wine factory” producers and not their most interesting bottles at that. 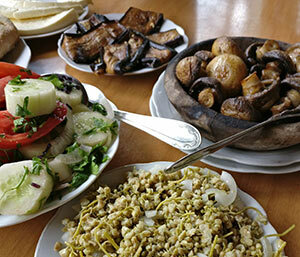 Despite abstaining from drink, our bellies full and we headed back to Tbilisi where more wine and food were waiting. While this was the shortest of the trips I’ve been on to Georgia, it was still fulfilling nonetheless and it’s a country where despite the traffic or weather or something else that may play against you on any given trip, you always come back home happy, sated, and usually with a suitcase reeking of spices you just couldn’t resist buying. Many thanks to the Georgian National Tourism Administration for making this trip and the book presentation possible.